Summary: Compared to the average growth rates prevailing over the past six decades, the U.S. has experienced a historic GDP gap or shortfall during this current recovery/expansion period. Real GDP growth has averaged 2.1 percent during this recovery/expansion (including a mere 0.8 percent in the first quarter of this year), which is far short of the 1956-2016 average of 3.1 percent, and less than half of the 4.3 percent real rate prevailing during periods of recovery and expansion. That has left a yawning GDP shortfall in 2016 of $2.7 trillion. After experiencing one of the worst recessions since the Great Depression from late 2007 to mid-2009, the subsequent period of recovery/expansion has grossly under-performed. In effect, the U.S. has experienced, and continues to experience, nearly a decade of poor economic performance. As the nation looks to a new presidential administration and a new Congress taking power in January 2017, SBE Council will be publishing a series of analyses that highlight key gaps or shortfalls in our economy, with a final report highlighting the basic policy changes needed to close these gaps. This first SBE Council “Gap Analysis” looks at the gap or shortfall in real gross domestic product (GDP). This report will be followed by analyses on investment, entrepreneurship, productivity, income, jobs, and trade, again with a final report on needed measures on the public policy front to shift the U.S. economy from low growth to robust growth. As for the GDP gap or shortfall, the last recession officially lasted from December 2007 to mid-2009. At the time of this writing, the subsequent recovery/expansion period has lasted 83 months and counting. That’s not a bad stretch. Unfortunately, though, real GDP growth during this time has badly under-performed compared to where history tells us we should be. As a result, polls consistently have shown large swathes of Americans still feeling like the U.S. is in a recession long after that recession officially came to an end (for example, see this Fox News poll). -Over the past six decades, from 1956 to 2016, real GDP growth averaged 3.1 percent. That includes periods of recession, recovery and expansion. -From 1956 to 2016, real GDP growth averaged 4.3 percent during periods of recovery and expansion. That is, periods excluding recessions. -During the current recovery/expansion period – from mid-2009 to the first quarter of 2016 – real GDP growth has averaged a mere 2.1 percent. That is less than half of the growth rate average during recovery/expansion periods, and roughly two-thirds of the average growth rate for the past six decades including recessions. This is an abysmal performance. 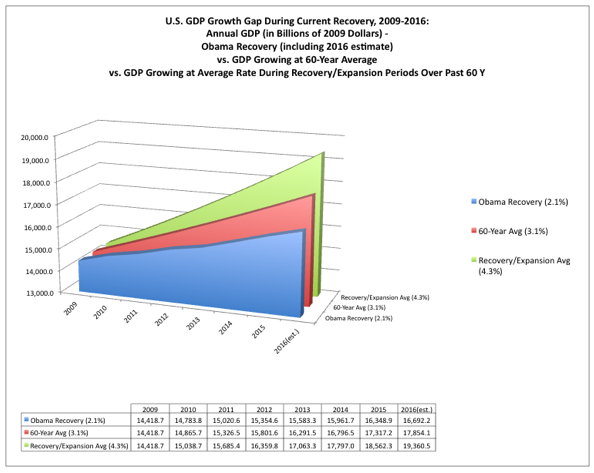 In fact, this Obama recovery ranks as the worst recovery/expansion period during the post-World War II era. -This poor recovery translates into a real GDP shortfall of a massive $1.2 trillion (in 2009 dollars) in 2016, compared to if the U.S. had grown at the 3.1 percent average real growth rate prevailing from 1956 to 2016. -Under the more appropriate analysis, however, the reality grows even worse. When one considers where the economy would be if the U.S. real growth rate since mid-2009 matched the average growth rate during periods of recovery and expansion (again, 4.3 percent), the real GDP gap or shortfall hits a breathtaking $2.7 trillion. 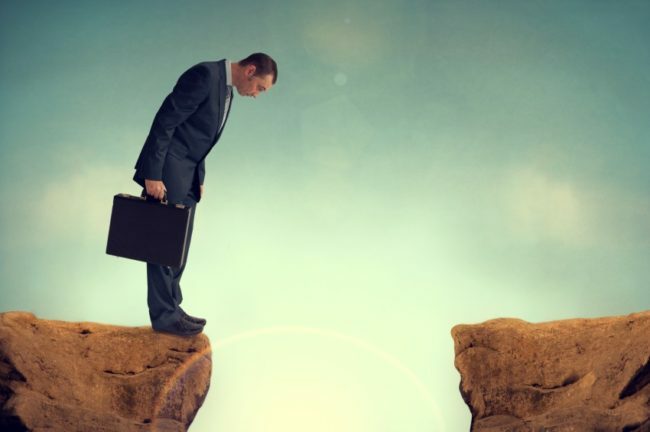 This GDP gap or shortfall means lost income and reduced standards of living for all Americans, and is intertwined with reduced investment, diminished opportunities for small businesses, lower levels of entrepreneurship, and restrained job creation. If the nation is going to get serious about the economy, then we have to take serious how far behind where we are right now compared to where we should be. The GDP gap is real and significant, and warrants serious attention. Political happy talk will not cut it. Serious action is needed.